Welcome to the Oslo website, chronicling the history and restoration of one of the most historic (and beautiful, in our collective view) 6-Metre class racing sailboats. Following a comprehensive restoration in Ashland, Wisconsin at J.W. Swan Boatworks, in late May 2012 she returned to Escanaba, Michigan for the first time in 64 years. With help from members of Escanaba Yacht Club, late tasks were completed and the hull painted, prior to shipment on 6 June 2012 from Newark to Goteborg, Sweden. With the help of Stockholms Batsnickeri she was relaunched on 9 July 2012, and subsequently resumed her long-interrupted race career in the European 6mR Championships in late July. 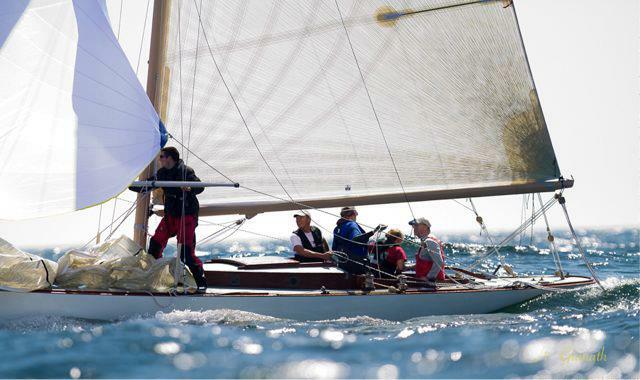 In August she came to Holland, and secured podium finishes in the Classic division of the annual Flevorace regatta. The Oslo was designed and built in 1925 by the renowned Johan Anker for Norway's Crown Prince Olav. She was his first 6-Metre boat, and after winning her maiden regatta in Norway she was shipped to America to participate in a team and individual competition between 4 boats representing the Scandinavian countries and four US 6-Metres. The Olso won several races in the series and came second overall to the top US boat, beaten by a margin of only 3/4 point. She remained in America, no doubt quickly sold based on her racing success, and emerged again 10 years later when my Grandfather, John Mitchell, purchased her and brought her to Escanaba, Michigan. She remained in the family until 1948, when she made way for the `Lucky Star´, a larger and more comfortable 44´yawl. The next two generations of the family enjoyed sailing on the Lucky Star but also heard stories first from Grampa John, later from aunts and uncles, about the fast, slightly uncomfortable racing sailboat that reputedly was once owned by the King of Norway. The search for the Oslo started casually in late 2007, and in earnest in 2009. It was the passing of our Uncle Jim, and the discovery of Grampa John´s old sailing photo albums, that provided a vital clue in the search. Further inquiries culminated with a special holiday message the day after Christmas, 2009: `Merry Christmas, Oslo is safe`. Read further under 'News' about how we rediscovered the Oslo, her amazing history, and how we restored her and resumed her successful racing career.